We’ve arrived at another January Friday, and around these parts it is still chilly (though a bit on the rainier side of chilly, and admittedly I would prefer to be on the snowy side), and still very much wool season for me. I also enjoy that this cardigan has pockets in it. I often forget about pockets as an option in sweaters and rarely design sweaters with pockets myself, but I think now I must remind myself of them. It makes a cardigan more functional, or even just gives you a nice little spot to place your hands. 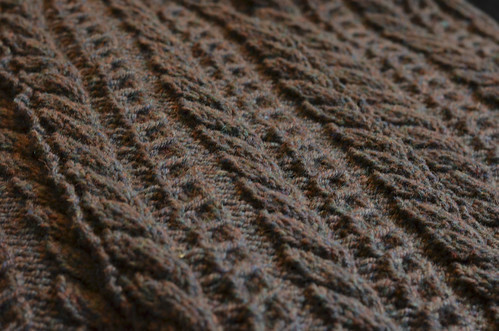 Speaking of jacket-like wool cardigans, I’m also chugging away on Smoky Lake. This really is very satisfying, working on a bulky-weight cabled…well, anything, frankly. I have been very lackadaisical on this knit, and after a few weeks of knitting have a back and 2 fronts and have started on 1 of the sleeves. Can’t wait to have it finished. Some folks have asked how I like knitting with this kind of rustic wool – both these cardigans are in different Briggs & Little yarns, which is 100% sheepswool. My answer is always – I LOVE IT. I love the sturdiness of it, and the way the lanolin from the wool eventually starts to rub off onto your hands. It isn’t the softest or drapey-est yarn in the world, no, but it is extremely warm, and since it’s a sturdy structural kind of yarn, it lends itself well to cables – which are very structural stitches. If anybody out there is not enjoying knitting with this wool, send it to me, I will find a good use for it, is what I am saying. It’s my favourite. Speaking of favourites, I’m also prepping some swatches for a future blog post series and am pulling out some favourite stashed yarns into service. More on that later this winter! It’s a refreshing exercise to go back to simply playing with yarns and auditioning stitches and patterns. Have a lovely weekend, knitter friends! With some cozy beverages and some knitting time, I hope. 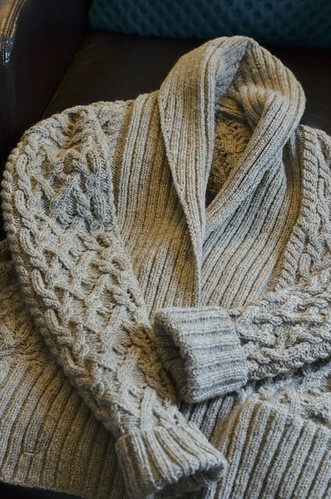 Your Exeter cardigan looks fantastic! that pop – they sure do! Wow, the Exeter looks like it was a LOT of work. 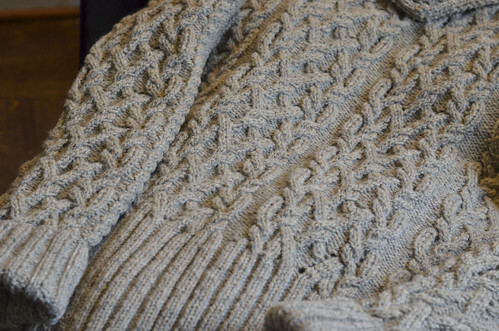 Absolutely beautiful and you’re right, that wool makes the cables pop! That cardigan is so beautiful!! 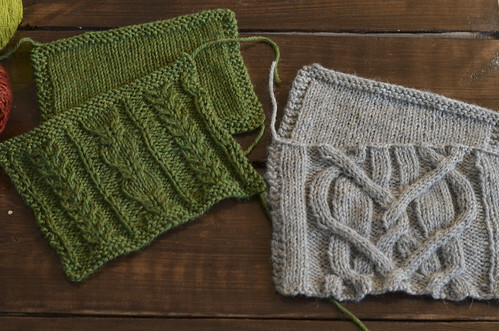 I have both cabling and making a sweater on my knitting goals list for this year! I also love Briggs & Little yarn and I’ve been knitting with it since I was a teenager (a long time ago!). As a matter of fact I find that after a good soak in hair conditioner, it becomes softer than most wool yarns including Cascade 220! Thanks for your comments on the yarn- I did ask about how you enjoyed knitting with it. I absolutely love the colours of Briggs and Little. I recently started a cardigan (Timber by Shannon Cook) with it and felt discouraged as it seemed rough and harsh on my hands. I wasn’t enjoying it. However, I tried prewashing the skeins as the commenter above suggested and kept at it. I’m so glad I did. I’m really enjoying the process now, and the cardigan is looking good. It feels good to work with a Canadian yarn! Holey bagels. The cabling is astounding! Awesome job. I have been wanting to do the same thing, play with yarns just to see what they can do. Looking forward to your post. Your sweater looks great. You inspire me to knit more sweaters. 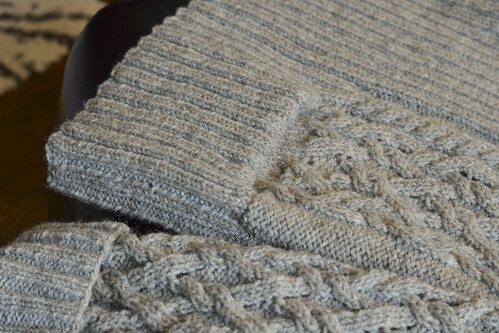 Lovely work, I too love the way pure wool shows up cables. Favourite yarn is Cascade 220. Briggs & Little is too often overlooked these days. I just love everything about it – the feel, the smell, the amazing colours! I just finished a hat in the brown heather and am about to cast on a cardigan in a cream colour. Thanks for giving them the shout out.